This is a result of a couple of weeks worth of performance testing. Tests covered different common setups, including same-drive backups, different drive backups, backing up local to/from USB2, local and USB3, local and a network share over SMB1 and over SMB2, over gigabit links and over WiFi, with warm cache and with cold cache, etc. The ultimate goal of testing was to determine optimal sizes of read and write requests, the total number of I/O buffers as well as to fine-tune the copying pipeline in general. overridden to be "flush always" or "flush never". Again, this is configurable via the .ini. destination file doesn't yet exist. this is done only if destination file exists. * Configurable via the .ini. it'd be a good idea in the disk I/O context. * Not configurable via the .ini. Surprise. This is an advanced-use option. Make sure to understand the caveats. It is now possible to set the app to archive existing backup copy of a file before updating it. In other words, the app will move file's backup copy to the archive and then re-copy the original in full to create new backup copy. Obviously, this is a form of file versioning. The reason it needs to be used with care is that it can chew through available disk space *like that* if the archive trimming is off, if the backup is run too often, if modified files are really large, etc. Quite a few opportunities for getting your backup routine in trouble. Hence the warning. See https://bvckup2.com/support/forum/topic/1140 for how to do this. You will also need to ensure that the Copying preference for the backup is set to "in full" (and not "delta") and the Deleting is set to "archive". An excellent way to shoot oneself in the foot. Please make sure you know exactly what you are doing. Similarly to how a backup can be configured to exclude/include files and folders when scanning the source location, it is now possible to do the same when scanning the destination. When running a backup, the app first scans the source and builds a tree of files and folders. It uses rules from the "Backup What" section of the backup settings to decide which items to include into the tree and which - not to. The resulting tree is exactly what needs to be backed up and nothing else. The app then scans the destination (or loads its snapshot saved from the last run) and builds a tree of what's already there. It then compares resulting two trees and compiles a list of file/folder operations that is needed to transform destination tree into the source tree. Prior to Release 72, destination scan was unconditional. It picked up everything that was on the disk. As of this release each backup now has a separate set of filters that is applied during the destination scan. By default the set is empty, so everything is included, just as before. However you can now add a rule to exclude certain files or folders and it will ultimately make the app act as if these items don't exist. This is obviously a *very* fertile ground for creating lots of peculiar issues. Please make sure you know what you are doing. 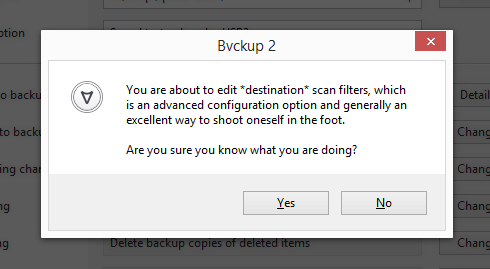 This option is particularly useful when backing up selected items from the source into a *pre-populated* destination. That is, when the source filters are set to "start with a blank list" with just some items included. It is now possible to tell the app to NOT monitor for the availability of a drive or a network share and just assume that they are readily available. This applies to real-time and periodic backups that would, by default, enter and remain in the "waiting for device..." state if either source or destination location is not presently available. This is primarily intended for cases when src/dst device is in fact unavailable normally and instead getting mounted or mapped by the pre-backup command. * This option has no effect if the device tracking - by fingerprint or by volume label - is enabled. As of Release 75 these options were superseded by "conf.wait_for_src" and "conf.wait_for_dst" keys whose meaning is inverted. Set them to 0 to suppress the "Waiting for device..." state. 1. Clicking on an empty toolbar area to the right of Go/Stop button now deselects any selected backups, while Ctrl-clicking there selects them all. 2. The issue with very long file/folder names overlapping neighboring fields in the main UI list has been resolved. 4. The versioning scheme has been extended to support interim maintenance releases. That is, there's now always one primary release (e.g. Release 72) that may be followed by one or more revisions to cover any required tweaks and bug fixes (e.g. Release 72 Revision 2). Revision information is now shown in the Help/About window when applicable. If you are on XP and see this issue, then update. Otherwise the update is not required. Resolves a (rare) issue with the backup planning module. More specifically, to handle rather exotic case of file "foo" getting moved into a new subfolder also called "foo", the app uses so-called "staged moving". It first creates a temporary folder, moved "foo" there, then creates the subfolder ("foo") and finally moves file "foo" there from the staging directory. This is all working well, however the UI had an issue where it would panic as creating and removing the staging folder weren't counted as backup steps, so it resulted in a discrepancy between expected and actual step counts. Incidentally, this was triggered in certain cases by enabling the "archive_modified" option (added in this release). Long story short - if you had "archive_modified" enabled and saw the app panic, then you need to update. Otherwise the update is optional. 1. Resolved the "GetFileInformationByHandleEx" issue on Vista - if you get this error during the Preparation phase of the backup, this fix is for you. 2. Resolved an issue with email notifications - when talking to a mail server, the app would erroneously think that the server does *not* support user logins if this capability was listed last in server's EHLO reply. In particular mail.1und1.de is like that. 3. Resolved an issue with LinkStation NASes - some models don't support 'created' timestamps *and* they return some really crazy values for these when an app queries them. This didn't go down well with the timestamp granularity detection module. No more. As of this release if the 'created' timestamps aren't supported, they are ignored altogether. 4. Improved timestamp granularity detection logic - when running a backup the app now keeps track of the largest difference between timestamp values that it asks the OS to set and the timestamp value that is actually gets set on a file. This is basically the "largest observed timestamp rounding error". The idea here is that if the timestamp granularity was not detected correctly (it was deduced to be lower than it actually is, i.e. 10 ms instead of 100 ms), then it can be automatically corrected through tracking of rounding errors. 5. Reduced per-file copying overhead in the delta copier - eliminated explicit file buffer flushing when closing CRC files. This should speed things up a bit when using delta copier. 6. The archival function now uses two separate tags when moving an item to the archive - one tag is for deleted files and another tag is for modified files if this is enabled (https://www.bvckup2.com/support/forum/topic/502/2958). Both tags now default to " ($date $time)" and they can be changed through the setting.ini file edit. It includes a fix/workaround for detecting TrueCrypt volumes getting mounted and unmounted when the app is running in service mode. The root of the issue is that TC broadcasts WM_DEVICECHANGE event only to the windows in its own session and it doesn't implement respective notifications for the services. To workaround this limitation R72.4 implements optional drive re-enumeration on timer. It basically goes through all drive letters every 10 seconds (the letter list and the interval are configurable through .ini) and checks for new/disappeared drives. This monitoring is disabled by default *unless* the app is running in service mode *and* the TrueCrypt driver is present and enabled on the system. Meaning, that if you don't use TC or if you are running in the default (application) mode, this change is transparent to you. Any news on when you will add the monthly scheduling for backups? "Destination file timestamps have changed since the last run"
@Peacecamper - Support for monthly backups is scheduled for the next release, i.e. Release 73. Releases are larger milestones that add features, and revisions are smaller interim releases that address any issues that may surface. @AndCycle - Ack, I think I know what might be causing this. Let me have a look and I'll ping you for a quick test when I got the fix in place, OK? Resolved an issue with files getting repeatedly backed up on every run after a single change *if* destination device doesn't support 'created' timestamps. The problem was introduced in R72 Rev 3 and it primarily affects people backing up to vanilla Samba-based storage devices. 1. Added support for Drive Extender NTFS reparse points - a simple matter of adding a reparse point of 0x80000005 to the list of RP types that are treated as regular file system entries. 2. Resolved an UI issue with closing of the message bar - in some very rare cases the message bar that floats up at the bottom of the window would end up in a slight overlap with the window contents. The UI would detect this and panic, so that I could take a look at why it happens and put a proper fix in. This is the fix. 3. Resolved an issue with network location monitoring - deleting a backup job that is in the "waiting for the network location" state didn't clear the actual location monitoring task and that caused the app trip a self-consistency check when the task completed. No more. 4. Reworked the code for disabling local file buffering - there's a way to tell Windows to *not* to do any local buffering when reading/writing a file over the network. This is meant to speed up the copying of larger files. The official way as described in MSDN simply doesn't work, so prior to this release the app resorted to using Zw... API as a replacement. Apparently, in some exceedingly rare cases this resulted in the app going down. The issue was further complicated by the fact that when it happened, this produced no stack trace. Long story short, the change was to switch to using Nt... version of the same API as it appears to be in a wide(r) use and it's generally accepted to be stable. I have been interested in this feature for some time and have provided feed back to you to add it into your bvckup. You have promised it will appear in bvckup3 but it has been some time. I am not sure why you are not very keen on it. Something to do with the disk space it uses? I am prompted to ask again as I just checked how my backup is operating and found that I am not operating versioning any more. It must have got lost over time somehow. I believed I was doing versioning - lulled into a false sense of security by the "delete archive" option. It does not do what I thought! So, I have to go back and rediscover how to switch on versioning in the config files. This is not as easy as it should be as the instructions are spread over multiple posts and are not all that clear. OK. I can do without the tools. But just one little checkbox please. You can surround it with all sorts of warnings about disk space etc etc if you like. Disk space usage *and* the convenience of recovering a backup from a specific date or specific file version. There are also several performance-related issues, in particular the need to re-copy every modified file *in full* on every backup. Summed up, it makes current implementation more of a hack than a proper feature so I am not comfortable with formally promoting it to one. It is functional and it is useful, but it's not up to the standards yet. With regards to how it managed to disable itself - is it possible that you've switched Copying to "Delta copying" at some point? This will effectively disable archiving of _modified_ files. Other than this, the app has no code to it that would reset "archive_modified" to 0 in the INI file. If you'd like, forward me settings.ini for the job and I can have a look. I'll also try and think of a way to make this option a bit more "sticky" and, for example, log an error if either of pre-conditions is broken. So, sorry to hear you will not put the option on a firmer footing yet. If you can do some work to make it less of a hack that would be good.
" ... is it possible that you've switched Copying to "Delta copying" at some point? " Yes, I think I did try out Delta copying. Perhaps that is what did it. The "archive_modified" override is ignored. Deletion must be set to "Archive" and Copying - to "In full", not "Delta".